Now don't get too excited, kid. For starters, your record player for Keebler elves only came with three Mighty Tiny records. How many times can you listen to "The Farmer and the Dell", "Twinkle Twinkle Little Star", and "Row, Row, Row Your Boat"? How many times do you think your parents are going to put up with it until they toss Mighty Tiny, records and all, into the fireplace? Second, once you hit your teenage years you'll find out soon enough that sometimes, tiny isn't always worth opening your mouth for. In that case, Mighty Tiny = Mighty Fail. Such a strange ad but oh, to think there was once a time where kids actually did get excited about something that didn't beep, tweet, text or light up. And that kid is wearing a Mighty Fake Happy Expression! I don't know why, but this invention sounds familar to me. Perhaps I am thinking of those little CDs that came out in the early 90s? I remember in the 80s, someone invented a portable record player which was like a large walkman. Well, the record was mostly exposed but the player was thinner and kind of robotic looking, I think. I wanted one SO bad so I could listen to music when taking road trips with the parental unit. It never occurred to me how much damage a bumby road might do to an LP, but you know, I liked the dream! And I agree, that is one fake smile! Or she's demonic. One or the other! Ha ha. 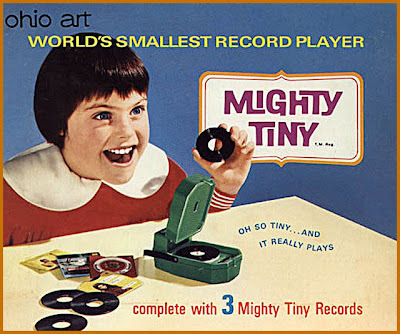 I don't remember this mighty tiny record player...but I do remember the Fisher Price plastic ones with the plastic "records". I don't think that was out when I was a kid, don't recall it, but that is interesting. The things people think up. This is great! i wish i had one right now!